Mobile apps and websites are transforming suicide prevention, says EDC’s Julie Goldstein Grumet. 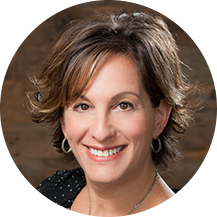 On Tuesday, May 8, Julie Goldstein Grumet will discuss how technology is changing suicide prevention at the HLTH conference in Las Vegas, Nevada. Follow the conference on Twitter at #HLTH2018. Advances in technology are changing how people access health care. For evidence, look no further than the growth of mindfulness, relaxation, and breathing mobile apps, which are turning smartphones into mental health tools. These same mobile apps and other tools such as electronic health records are also changing suicide prevention efforts—and these advances have the potential to transform the field, says EDC’s Julie Goldstein Grumet. Here, she talks about how things are changing for both patients and care providers. Q. How can websites and apps support mental health? Goldstein Grumet: I think these tools can really expand access to mental health care services for people who would not ordinarily access care. Many people who are referred for mental health services by a primary care doctor never follow up with that appointment. So we need to help primary care doctors find ways to deliver some level of mental health care to patients. Mental health-focused websites and apps can provide patients with skills and resources to manage their thoughts, feelings, and behaviors in case they never see a mental health provider. Q. Can these resources also serve as a complement to clinical care? Goldstein Grumet: Certainly. There are a number of apps and websites that extend care outside of the therapist’s office for people who do engage in treatment with a mental health provider. These resources provide an effective way for patients to practice skills they are learning in treatment. Many of them also provide stories about others encountering some of the same challenges, helping them feel less isolated or more hopeful. Q. In your work, you focus on suicide prevention. How is technology being used to support people at risk of suicide? Goldstein Grumet: Technology is changing how we think about safety planning—the steps that people at risk for suicide can take to manage their suicidal thoughts and create support systems. Some apps help people record and track how they implement and modify their safety plan. Safety plans can be directly entered into the patient’s electronic health record, too, which facilitates communication between the patient and perhaps multiple doctors caring for them about how well their safety plan is working. The development of websites that are intended to help people who are having suicidal thoughts is another example of technology informing suicide prevention efforts. One website, called Now Matters Now, teaches individuals how to use dialectical behavior therapy (DBT) skills to manage their thoughts of suicide and engage in other positive behaviors. DBT is an effective, evidence-based treatment for suicide, but finding a therapist trained in DBT can be challenging, so access to a website like this is incredibly helpful. Some clinicians also encourage patients to use Now Matters Now to practice safety planning skills in between sessions. Texting is also highly utilized for suicide prevention and is particularly appealing to young people. The National Suicide Prevention Lifeline takes hotline calls via online chat, and Crisis Text Line is a service entirely devoted to handling crises via text. Technology is broadening how and where we traditionally provided mental health care. Using the technology that people are already comfortable with, like texting and apps, makes these types of resources more appealing. Q. How are advances in technology changing how providers care for patients at risk? Goldstein Grumet: Electronic health records (EHRs) have really changed what is possible in suicide prevention. Not only do EHRs allow clinicians to access a patient’s complete health history, but they can also help reinforce policies and activities that you are trying to embed into clinical practice. So let’s say a clinician is doing a mental health screening, and a patient says that he or she has had thoughts of suicide. Once the clinician enters that information, the EHR can prompt the clinician to conduct a safety plan or to make a referral for therapy. You can even build in hard stops so that the clinician cannot move on to the next screen until those things have happened. Technology provides accountability in a way that was impossible with paper records. Q. Most of these innovations have the patient in mind. Is technology also changing how clinicians are trained to deliver mental health care? Goldstein Grumet: It is. Many health care providers never received training in suicide prevention and care, and there’s a critical need for this training. As part of our Zero Suicide work, EDC is collaborating with SIMmersion on a NIMH-funded project to develop suicide prevention trainings that simulate what sitting with a suicidal patient feels like. The goal of this training is to allow the health care provider to practice conversations—and then get feedback about their techniques.